Climate change has emerged as the world’s most critical environmental issue, as well as one of the most pressing social, economic and health challenges of our time. While it is a global issue, its impacts are felt most acutely at the local level. From families that are displaced by flooding to elderly grandparents who are hospitalized because of health complications from extreme heat, the impacts of climate change are very real and very personal. The statistics prove it. For example, heat waves in the United States have almost tripled compared to the long-term average, and now kill more people in cities than all other weather-related events combined. Extreme heat is a public health hazard that’s driven by climate change, but it’s not the only health hazard. The Centers for Disease Control and Prevention have identified eight ways climate change is impacting human health, resulting in increased respiratory illnesses, mental health impacts, cardiovascular failure and more. How Can Parks Be a Climate Solution? While the impacts of climate change are daunting, there is growing recognition that parks can be part of the climate solution. Parks reduce harmful carbon pollution that is driving climate change; they protect people and infrastructure from increasingly severe storms, sea-level rise, heat waves and droughts; and they also directly reduce some of the primary public health challenges that are exacerbated by climate change. Below are a few examples of how parks can be a climate solution. Parks and trees are one of the most effective ways to combat extreme heat. A recent study in Baltimore, Maryland, and Washington, D.C., showed that on one of the hottest days last summer, parks were a cooling oasis — as much as 17 degrees cooler than parts of the city lacking trees and green space. In addition, the cooling benefit of parks can extend as far as a half-mile from park boundaries, helping cool the neighborhood and reduce heat stress for residents. Parks that incorporate water-smart landscaping features (called “green infrastructure”) can reduce flooding and protect water quality. Green infrastructure can filter as much as 95 percent of major pollutants out of stormwater runoff. Research has also shown that green infrastructure features, such as rain gardens, can reduce stormwater runoff by as much as 90 percent, reducing the likelihood of costly flooding. Urban tree canopy in parks and along city streets is estimated to remove 711,000 metric tons of air pollution annually (a $3.8 billion value) and sequester more than 90 million metric tons of carbon (CO2 equivalent). That’s the equivalent of removing more than 19 million cars from the road for one year. Urban trees also filter particulate matter from automobiles and other vehicles, further cleaning the air. Cool: Shady green spaces reduce the “heat island” effect to protect people from heat waves and reduce summer energy use. Absorb: Water-smart parks, playgrounds and streetscapes absorb rainfall, reduce flooding and recharge drinking water supplies, while saving energy for water management. Protect: Strategically placed and managed parks and natural lands buffer cities from rising seas, coastal storms, inland flooding and wildfires. Connect: Trails, greenways and park systems provide carbon-free transportation options and link residents to popular destinations and to one another. While each of these objectives is robust in isolation, to maximize positive climate and health outcomes, it’s important to develop and implement strategic green infrastructure networks that stack these benefits at the site, neighborhood and city scales. It might seem obvious, but it’s worth stating: Projects that provide multiple benefits — cooling, absorbing, protecting, connecting — will generally provide a greater return on investment than single-purpose projects. In addition to siting projects strategically, it’s important that park development and programming build social cohesion. A community’s ability to withstand climate disasters and come back stronger is determined, in large part, by the social fabric of the community. In times of hardship, this social cohesion can define the successes or failures of a community. Parks and open space directly improve environmental resilience, but they also build social and economic resilience, particularly if they are developed and stewarded in a collaborative, community-driven approach. Finally, it is important to remember that climate change impacts everyone, but it is often low-income communities that are hit first and hit the hardest. It is critical to prioritize park investments in underserved communities that lack access to high-quality parks. Are you ready to act? Keep these guiding principles in mind and check out the resources included at left to get started helping your community deploy parks as a climate solution. The 10-Minute Walk Campaign is a growing nationwide movement to ensure there’s a great park within a 10-minute walk of every person, in every neighborhood, in every city across America. More than 230 mayors have signed on to this growing campaign. Check the website to learn more and get your mayor to take the pledge. NRPA’s Great Urban Parks Program is helping advance green infrastructure stormwater management projects within parks. Check out its Resource Guide for Planning, Designing and Implementing Green Infrastructure in Parks. Parkology™ is a comprehensive online resource and community of experts dedicated to improving access to close-to-home, quality parks. 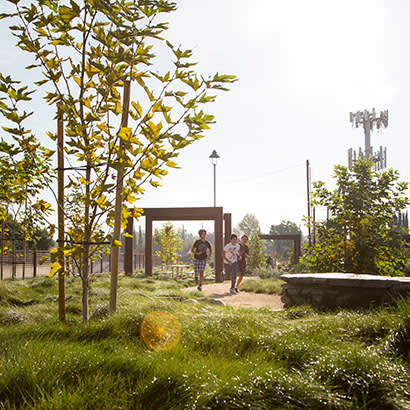 Check out the knowledge section for tips on how to design climate-smart parks. This site is managed jointly by The Trust for Public Land, City Parks Alliance and NRPA. The Trust for Public Land’s Climate Smart Cities Program helps cities use people and data-driven decision making to maximize social, health and climate benefits of new and proposed parks. Field Guide for Parks and Creative Placemaking lays out how to create parks that serve as cultural assets that build social cohesion and social capital — key ingredients in creating resilient, prepared communities. Taj Schottland is the Climate-Smart Cities Program Manager, Green Infrastructure for The Trust for Public Lands. “Extreme Weather.” National Climate Assessment. Accessed September 25, 2018. “Extreme Heat.” Ready.gov. Accessed September 25, 2018. “Climate Effects on Health.” Centers for Disease Control and Prevention. July 26, 2016. Accessed October 02, 2018. Detailed maps of urban heat island effects in Washington, DC, and Baltimore. The Benefits of Green Infrastructure for Heat Mitigation and Emissions Reductions in Cities. Report. Urban Climate Lab, Georgia Institute of Technology. Trust for Public Land. Accessed September 25, 2018. Center for Watershed Protection. 2017. Review of the Available Literature and Data on the Runoff and Pollutant Removal Capabilities of Urban Trees. Crediting Framework Product #1 for the project Making Urban Trees Count: A Project to Demonstrate the Role of Urban Trees in Achieving Regulatory Compliance for Clean Water. Center for Watershed Protection, Ellicott City, MD. NEIWPCC et al. Greening Your Community Cost-effective LID solutions. Fact Sheet 5 of 5. Accessed September 26, 2018. Nowak, David J., Daniel E. Crane, and Jack C. Stevens. “Air Pollution Removal by Urban Trees and Shrubs in the United States.” Treesearch. Accessed September 25, 2018. Inventory of U.S. Greenhouse Gas Emissions and Sinks 1990-2016. Report no. EPA 430-R-18-003. United States Environmental Protection Agency. “Greenhouse Gas Equivalencies Calculator.” EPA. May 25, 2018. Accessed September 25, 2018.